Download this free aromatherapy music, play it when you have an aromatic bath, light a candle or doing meditation /yoga. Apart from aromatherapy, music also has a place in promoting positive changes in the well being of an individual. Music for aromatherapy and meditation is rhythmic music that is slow and soothing. This simple music sends signals to your body to relax. Your muscles relax. Your breathing slows and becomes deeper. Meditation music decreases your stress level and removes distractions.
" I have been writing meditation/background music for my own CDS which I do in conjunction with a Hypnotherapist and a Reiki Master." This is a pretty old tune. Peace throughout the world. Peace within us all............. Traditional Irish Melody. I am tired of all the sadness. I am tired of all the tears. The music of Jiri Klokocka builds on harmonies and melodies in classical style and rhythm from world music. The purpose is to help listeners to feel lucky. Jiri is playing classical guitar, electric guitar, keyboards, drums and overtone song. He came out in the swedish broadcast at 1980 with his "Flowering Cherry-Tree". I like " Palace of Peace and Love" by Jiri Klokocka. This music is a walk through the Palace of Peace and Love. You follow a long hallway, look in different chambers of this palace and experience these chambers special energies. Download This song at "Jiri Klokocka" Website. MANY THANKS! to above artist who give me permission to share their lovely music in my site. God Bless You All! 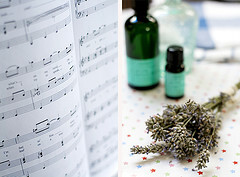 Listen and Play these free aromatherapy music online. Download them, I hope you'll like them. These Free aromatherapy music are taken from VA - Aromatherapy (Complete 10 CD Collection Of Relaxation Music). Forest Awakening - Aromatherapy Music Online Download.